Mid-sized food manufacturers, processors and distributors. Since 1988, Aspen Systems has been dedicated to serving the specialized needs of the Food Processing and Distribution Industry. Developer of ERP Canopy software designed specifically for the Food Industry, including Financial Management, Production Management, Data Capture / RF Scanning, Lot Control and Traceability, eCommerce (EDI & Web Based Customer Order Entry), Scaling and Bar Code Printing. Available only through Aspen direct sales. 100% Made and Supported in the USA. Comments: We are a wholsale specialty food distributor that went live on Canopy in 2005. We've been very happy with our decision to move to this platform. Canopy has been an excellent software that has facilitated and supported our substantial growth. It's flexibility and ease of use has given us the ability to focus more acutley on our business and make decisions with more detailed information that we could have ever obtained from our previous software. Although there are a myriad of excellent canned reports, Canopy also provides you with the ability to write custom reports, allowing you to tailor information to your specific needs. No need to be a SQL programmer, the AspenView interface helps you with the code behind the report. Another key benefit is the integration of their Document Imaging module that allows us to scan invoices and other source documents directly into Canopy. This has reduced our labor costs significantly by eliminating the need to root through filing cabinets when analyzing accounts. It has also improved cash flow by giving us the ability to pull up a proof of delivery and faxing or emailing a copy to a customer directly from Canopy while the customer is still on the phone. There are many more excellent features within the software, but customer support is important as well. We have found Aspen's customer support team to be excellent, responsive and professional. I highly recommend Aspen Systems and its Canopy software. Comments: We are a Meat Distributor, and have utilized Canopy since 2009, and been an Aspen Systems Customer since the early 1990's. 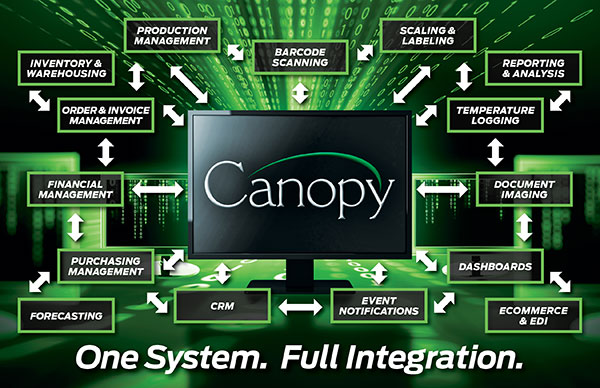 Canopy as a whole is a robust feature rich software written for the Food Industry that is very easy to use, customizable, and easy to integrate with third party applications such as Microsoft Office, other SQL databases, and routing solutions. I have been told by end users that have worked in the meat industry for 20+ years that Canopy is the best ERP application that they've worked with. In my opinion, Canopy is a great software weather you are an organization of 5 employees or 500 employees. It is completely scalable, user friendly, and easy to manage. In addition, Aspen's Customer Support team is by far the best I've worked with. They are based here in the USA, and many were at one point end users of the software (So they have personally worked with the software, and know how it works on a day to day basis from the point of view of the end user). I would not hesitate to recommend the software, and should you have any questions, please feel free to reach out to me. Change is difficult but worth the effort. Comments: We made a conversion a little over 18 months ago to Canopy. It is an intricate and detailed system. It challenged us initially but has been an invaluable asset as we continue to grow our business. There is so much depth to the system that we are continuing to learn new features and worthwhile benefits almost daily. I personally challenge the customer service staff often with intricate questions. They do not always respond immediately, but always respond effectively; taking the time to truly understand my needs and concerns.